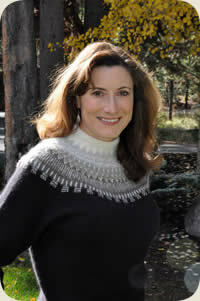 Anne Berk is a fiber enthusiast who loves to teach other knitters who share her passion. You will have all of your questions answered, and learn new tips, tricks and techniques. Annes top priority is that everyone has a fun and relaxing experience, returning home energized and inspired. Anne sees herself as a teacher instead of a real designer and calls her inspiration her "teaching points". She loves to encourage her students to work through issues they have by breaking down problems step-by-step and practice their techniques. Her favorite knitting tip begins with preparation - the time spent in preparation and practice will save time and energy later. She believes that creativity cannot happen without "play", so have fun and enjoy the prep process of knitting by creating swatches to test a stitch pattern, the yarn and the needles you will use. Anne Berk grew up in Grinnell, IA and has been knitting since she was 8 years old. She has mastered many different areas of crafts such as crochet, embroidery, cross-stitch, macramé and sewing, though knitting is her passion. Anne became a camp counselor and craft director at Camp Namanu during her summer vacations for multiple years, helping stimulate her creative mind. Knitting took a break while Anne completed a masters degree in Natural Science pre-med, and then went on to become an Optometric Physician, opening a private practice in Portland with her husband in 1985. After her children went off to school, she got serious about crafting once again and her love for fiber arts was rekindled. She completed the TKGA Handknitting program in 2003 and was extremely busy doing commission work for yarn store customers, as well as teaching classes in small yarn stores, and large events in the Northwest. Though she loved restoring family heirlooms and helping knitters resolve and overcome their problems, her daily schedule became overwhelming so she had to stop taking on commission work. Instead she focused her time on building and creating knitting courses, based on recurring problems that knitters have, and tried to solve issues in the best and most efficient way possible. This led her into her forte- she has since been working on Intarsia and knitting in the round. Anne Berk realized that Intarsia is not as accessible to knitters of all skill-levels as it should be, and has made it her mission to create a technique that is easily mastered by all. Enter, ‘Annetarsia’. “Annetarsia Knits” is her self-published resource book focusing on intarsia (or “Annetarsia”) instruction at every level, breaking down techniques into simple steps that are easy to understand and follow. Anne has created new concepts and found solutions to previously unanswered problems; all of which are disclosed in her fascinating book full of tutorials, projects and samples for readers to try at home. In addition to this book, many articles and projects have been published in Piecework magazine, Sockupied, ColorKnit, Twist Collective and designs have been published by Jane Austen Knits and Blue Moon Fiber Arts.